Recently Evin, an American ex-pat I met when I was in Cork, published a book of knitting and sewing patterns, paired with recipes based around the changing seasons. The book is now going on a blog tour, and today it’s calling at Fibre Friends. Evin first mentioned her book idea around a year ago, shortly before she started her Kickstarter campaign. At the time I was newly and surprisingly out of work as the job I had lined up had evaporated, so when Evin asked me to help out with the technical aspects of the knitting patterns, I had both the inclination and the time to get stuck in. For most of the knitting projects, this involved checking for typos and making sure all the numbers added up correctly before the patterns could be sent to test knitters. One project, though, ended up being much more of a team effort. Evin had a very definite plan for her Falling Petals shawl, complete with detailed sketches of the overall design and a pattern for the lace border. Unfortunately the vision wasn’t quite meeting up with reality. Luckily, Evin and I have complementary skill sets when it comes to designing shawls. Evin is a visual person who can form an idea in her mind of what she wants to have and put that down on paper. I’m not very visual, and don’t seem to be inclined towards design, but I do have a lot of experience of staring at pages of numbers until they do what they’re told. 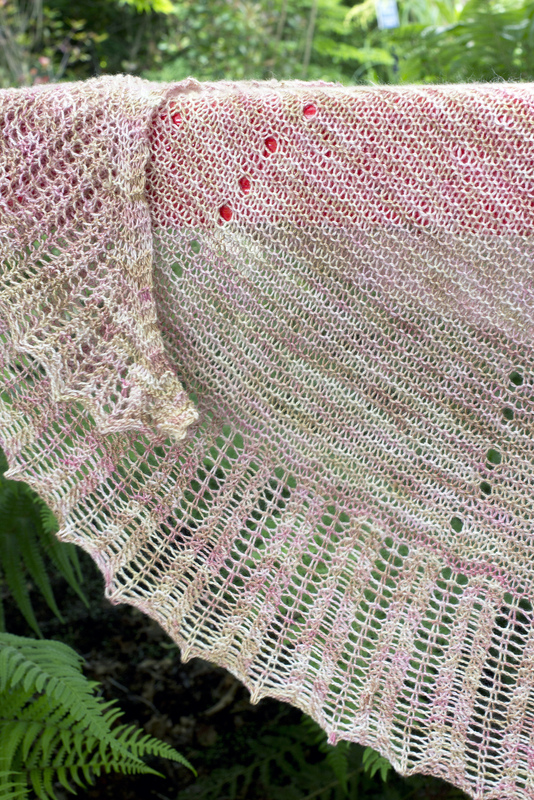 The tricky part wasn’t, as you might expect, the lace edging, it was the body of the shawl. The body of the shawl has two types of increases. One increase creates the semi-circular shape (technically half an octagon, but who’s counting). These increases had to be invisible, hiding among the garter stitch. The other increases were to be yarn overs, creating the impression of blossoms falling from the trees. The distribution of the increases had to be different, so we had to figure out how to space them on each row, making sure that the stitch count always made sense. I won’t go into the details, but there were spreadsheets. The end result is a shawl that is simple to knit but looks impressive, and a pattern that Evin and I can be proud of having created together. You can purchase the book from Big Cartel and follow Evin’s other adventures at her blog. To follow this book on it’s tour, check out the following blogs over the next few days. This entry was posted in Uncategorized by stew. Bookmark the permalink. I love this post and working together was a worthwhile experience. I couldn’t have done it without you, Stew! Hope you like the pattern, Lynda! Like shawl where do I get pattern?